Copywriting… writing from this place that engages your audiences and talking to people that you want to come into your office… writing for those patients that you connect with on a different level… These are all hugely important when it comes to working with clients that you want to work with. This is why I’ve brought Michael Stanclift onto the show today. 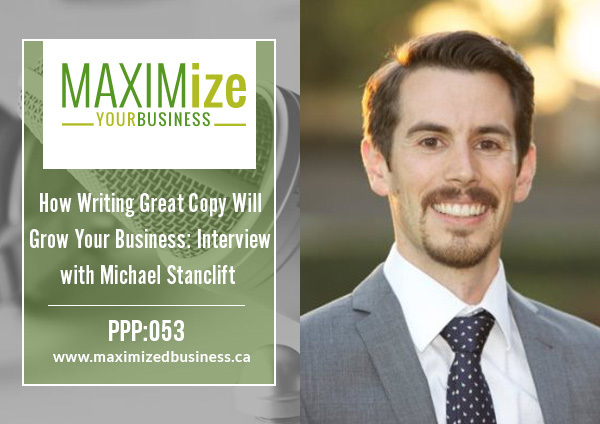 Michael has created a clinic that is thriving clinic, just by using his copywriting skills (and he’s been featured in the Huffington Post multiple times). This is something that I think everybody should listen to because this call has left me feeling like I am more than capable of writing blog posts and things of that sort to connect with the clients that I want to. How did you get into copywriting? What are the differences between how people think they should write and that personal touch that people want to read? How do you incorporate writing into your life while balancing a practice and having a family? Why your content needs to connect with people. How Michael started writing for the Huffington Post. What time of day Michael writes to get the best results. Where he finds inspiration online and who he has learned from. Michale’s recommendations for getting into writing. Listen to Last Week’s Episode!